Comedy super stars Kevin Hart & Tiffany Haddish star in the hilarious new movie Night School, and you could be one of the first to see it in Queensland! It’s River 94.9’s special preview and it’s happening at Limelight Cinemas Ipswich at 6:30pm on Wednesday the 26th of September! For your chance to win your way there, keep listening to Marnie and Campo for Breakfast, Ilija for your Home Run or you can get your entry in below to be in the running to secure yourself tickets. Don’t miss the laugh out loud comedy, Night School at Limelight Cinemas from September 27! Star Kevin Hart and producer Will Packer, who partnered for the hit Ride Along and Think Like a Man series, bring their signature style to NIGH SCHOOL. The comedy from director Malcolm D. Lee (Girls Trip), also starring Tiffany Haddish, follows a group of misfits who are forced to attend adult classes in the longshot chance they’ll pass the GED exam. NIGHT SCHOOL is at Limelight Cinemas September 27. 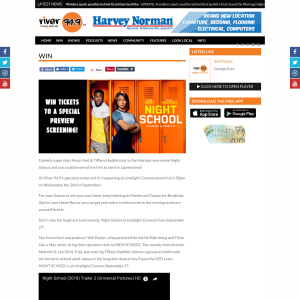 Please note the tickets won on air and online are valid for River 94.9’s Night School preview at Limelight Cinemas on 26/09/18 and tickets cannot be transferred to another performance date. On air competition dates with Marnie and Campo for Breakfast are weekdays between 10/09/2018 and 21/09/2018 and with your Home Run between 17/09/2018 and 21/09/2018. Online competition dates are 08/09/2018 to 10am 21/09/2018.